them? I know my disadvantages , I am trying to struggle against them. immediately I stop all contacts with him .Please be honest with me. You can ask me any questions , I will answer you with a pleasure. agree with me? It is not possible to tell everything in the one letter. I hope we will have enough time to learn more about each other. Impatiently waiting for your answer. cook,ha ha ha !!! I am very optimistic person and I don't give up ! hope my letter will find you in high spirits! problem, she doesn't speak English , she studied French at school ! with me ! What the word " woman" means for you? that you told me about yourself.It is very interesting for me. My break is over and I have to go now ! How are you today? How is your mood? I am in high spirits today . It is so sunny day today that it makes me smiling !!! !I have a suggestions, can you smile now ! You know I choose these pictures special for you, because they make me smiling when I look at them . Sometimes my aunt calls me curly-headed sunshine and when I smile I look like a sunshine!!! Everything is going right way today ! I always prepare a breakfast for me and for my aunty. I was making an omelette today , it was so delicious that my aunt asked me more of it. She asked me :" I think you fall in love, am I right?" Ha ha ha. I told her that everything is possible and maybe its time for it. Now ,when I am reading your letter I understand how lucky I am to meet you. The translator, who translates all your letters told me that I can make my man happy. I didn't pay enough attention in it. But now, I feel regret about it ! I pay for this mistake now. I have to pay 4.56$ for each letter or 100 $ for 1 month unlimited correspondence. And for me and for my aunty it is a big money. My aunt gives me money for the correspondence with you. my aunt swear to be a mother for me and live only for me ! I dont want to become a burden to her. I promise you that I will study it even if I have to do it by nights ! My dear, my break is over , I have to go now, and after I will go to library to read about your country. I want to know everything about you!!!!!!! if you will help me to pay for our correspondence. You can use Western Union. decide together what to do and how to be! Honey, I don't have any contract in Internet Cafe. Happy to see your letter! I often think, what will it be like if we never met by Internet. to those, who we love. Das Passbild wurde nachträglich in die Passkopie einretuschiert. Deutlich zu erkennen an der nicht komplett rundlaufenden Prägung des Siegels. Das Passbild selber wurde ebenfalls retuschiert. Oben am Bildrand sind deutliche Spuren zu erkennen. Die Passnummer ist bereits bei einem anderen Fall aufgefallen. Hier noch einmal die beiden Pässe im direkten Vergleich. Zitat: I have to pay 4.56$ for each letter or 100 $ for 1 month unlimited correspondence. we should pay 100 USD for unlimited three months correspondence. Antwort auf die Frage, warum die Bilder aus dem Jahre 2005 stammen. Regards to your friend! Picture were taken this year! No needs to blame me without any reason! Interessanter Weise wurden alle Fotos am selben Tag mit der selben Kamera geschossen, mit Ausnahme des Fotos 3st, welches mit eine Olympus C4040Z anstatt einer Canon Powershot A80 gemacht wurde. Da die Lady ständig mit anderen neuwertigen Klamooten auf den Fotos abgebildet ist, könnte man mutmaßen, dass hier jemand mit der Dame ein Fotoshooting veranstaltet hat, dem eine Shoppingtour durch Luhansks Boutiquen voran gegangen ist. Das Kameramodell Canon Powershot A80 ist schon bei anderen Luhansker Damen aufgefallen. Ein komplett rundes Siegel ist nicht möglich, da man immer noch einen Höhenunterschied zwischen Oberfläche des Passes und des Passfotos hat. Bei meinen Originalen habe ich auch bei bester Qualität daher keine absolut runden Siegel. Auch sind diese verschieden ausgeprägt, von sehr gut bis nicht vorhanden (auch das gibt es). Das im oberen Bereich des Passfotos noch die Prägung zwischen den beiden Linien sichtbar ist, neigt mich eher dazu, diesen Bereich als unverletzt anzusehen (da ich Ähnliches auch tlw. bei meinen Originalen habe). Und bei der Reduzierung von Größe und Qualität (möglich wären auch Scanfehler) kommt es ebenfalls zu Verlusten, teilweise durch Blockbildung, tlw. auch durch Verschwimmen von Farbnuancen. Aus diesem Grund lassen sich ukrainische Inlandspässe nur sehr schwer beurteilen und ich neige da eher zur Vorsicht. Daher muss ich mich auf grafische einwandfrei beurteilbare Fakten konzentrieren. Und das fängt bei der Passnummer an und hört bei der Handschrift auf. Da ich derzeit kein Original eines ukrainischen Inlandspasses der EM-Serie habe, lasse ich diesen Bereich jetzt liegen und konzentriere mich auf die Handschrift im Datenbereich. Die Vermessung der Buchstaben zeigt auf, dass gleiche Buchstaben in Höhe und Steigung identisch sind. Ich glaube nicht, dass das eine - wenn auch kalligrafisch geübte - Person in einer ukrainischen Amtsstube fertig bringt. Daher nehme ich an, dass es sich hier um einen Handschriften-Font einer kyrillischen Computerschrift handelt! Meine Originale weisen zwar auch tlw. Computerdruck im Datenteil auf, aber keine davon in einem Skript- oder Handschriftenfont! In diesem Bereich lässt sich eher die Echtheit eines ukrainischen Inlandspasses beurteilen. Hier sollte man auf jeden Fall die Seiten 2 und 3 des Passes anfordern. 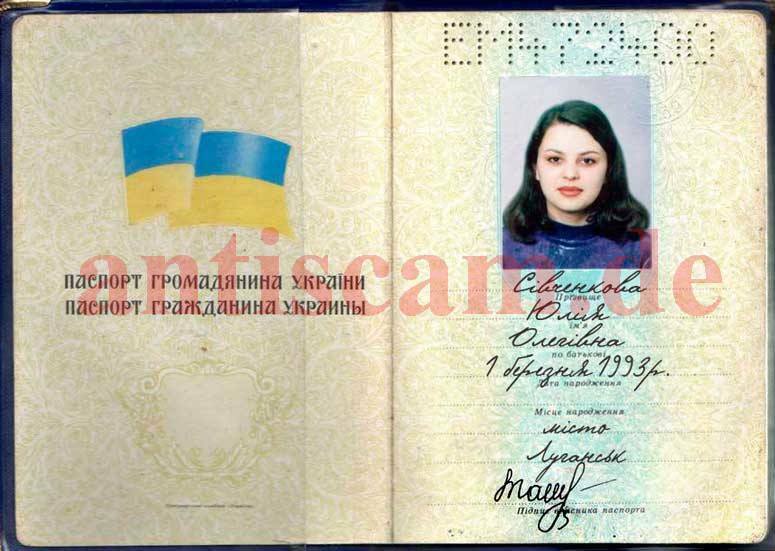 Mit 20 bekommen die Ukrainer ein neues Foto in den Pass auf Seite 3. Seite 2 dagegen enthält Daten. 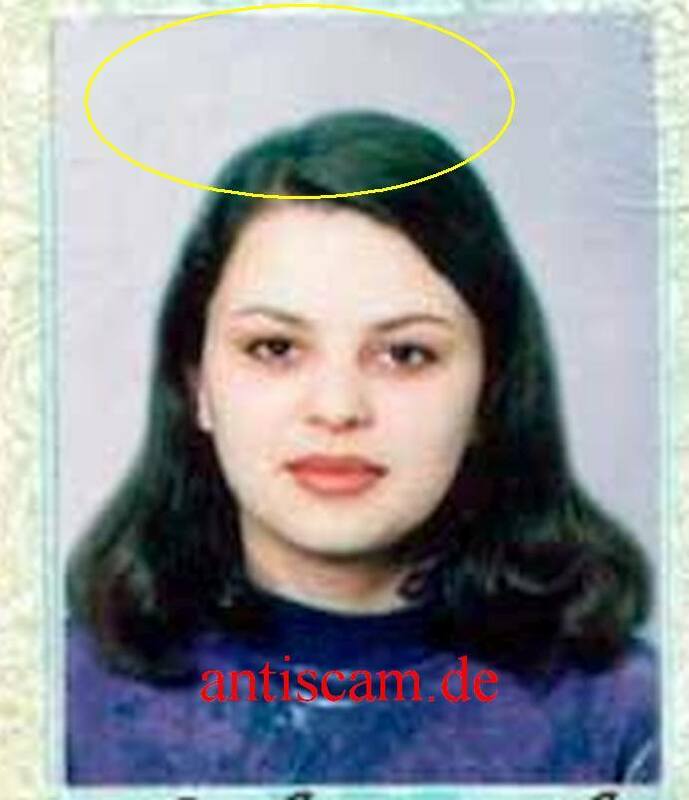 Da Yuliya nun 1993 geboren sein will, sollte sie 2013 ein neues Passfoto bekommen haben. Und das Foto auf unserem Pass zeigt definitiv keine Frau mit 20 Jahren, sondern eher ein "braves" Mädchen von knapp 14 Jahren. Please switch on TV and watch the news about Ukraine, particularly Lugansk! We don't sleep for 3 nights. I can hear the gun shots from everywhere. So many people with the gun outside. I can't go out to buy bread, but had to come to Internet Cafe and explain you the situation. I'm happy you have a professional friend, but I'm not a professional photographer. I have no camera. My friend, who took my pictures, moved from my country with her family. People are leaving my area. I was happy I found you. You were so sweet to me. Believe me, I long for love, attention and care, but to be honest now I want just to stay alive, that's my first priority. Maybe it's hard for you to realize where I live now, but trust my words. 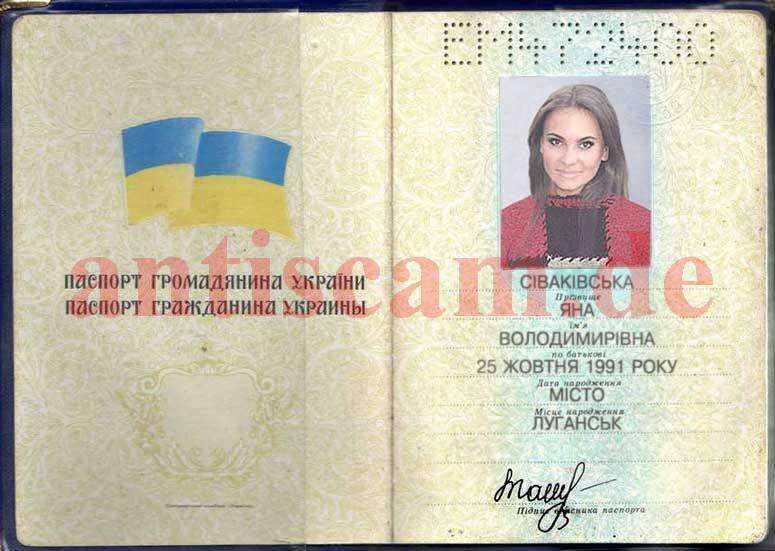 I sent you the copy of my Ukrainian ID and you have my details for Western Union. Here is my number: +38(050)57-06-467. If you are really serious and interested in me, help me with the money for correspondence. And if you do, I'll come and reply to your letters no matter the situation. Please send me reply by sms. I have no money for letters. One more thing, I won't prove anything to your friend! Maybe there was a wrong date setting on camera. I have no job, my aunty don't get salary for 4 months. There is a gun shot outside. Every letter to you cost 5$, it's very huge amount for me. It's up for you to decide. I can't reply by letters. thank you very much for your trust in me and that you sent me your phone number. I already called you , but nobody picked up. So I sent a short SMS. Ok, your explaination is reasonable. sometime the date at my camerea or phone is also not set correctly. Nevertheless, please send me what I asked you in my previous message. It's also a matter of trust. I already asked my freind to make some new photos from me, which I will send to you then.